Continuing the Photoshop tutorial series on how to create simple photo borders/frames. Moving on from Part 1 . Here are two more very simple, easy and quick ways of drawing frames and borders to your digital photos or images, using Photoshop CS2. Basic images used here are copies of my original photos and have been resized to 800 x 600 pixels. Step 1. In Photoshop, open the image that you want to use – press Ctrl+O (or go to File > Open) and browse to choose and open your image. Step 2. Then duplicate the Background layer – press Ctrl+J and you’ll notice a Background copy is created in the Layers Palette which Photoshop has named it Layer 1. Double-click on the name and rename it Photo, so as not to be confused with new layers created later. Then, click on the Eye icon to the right of the Background layer to remove visibility. Step 3. Next is to add a new layer below the Photo Layer, increase its canvas size and fill it with color or pattern, which will become the border. To do this, with the Photo layer still selected in the Layers Palette, hold down the Ctrl key whilst you click on the Create a new layer icon at the bottom. 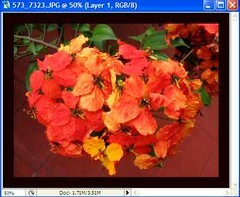 This brings forth a new layer below the Photo layer and will be automatically named Layer 1. 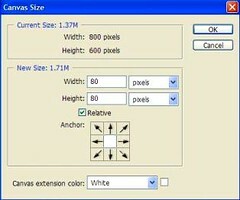 Then, increase its canvas size – with Layer 1 still selected, press Alt+Ctrl+C or go to Image > Canvas Size, to open its dialog box and key in your desired increase in pixels and select Relative as illustrated in image. The greater the increase, the broader the border will be. Click OK to accept and exit window. Now, to color the border – use the Eyedropper Tool from the toolbar to choose the color from the image itself or click on the Set foreground color box to open up the Color Picker palette for other colors. Then, paint the extended canvas with the Paint Bucket Tool (or press Alt+Backspace on keyboard to paint in the foreground color). You can now move on to add a second border, third and so on, if you want a more creative and impressive frame. Just add new layers by repeating Step 3 a few more times, filling each new layer with a different color, or alternating between two colors. However, bear in mind that each subsequent new border layer is created below the previous one as illustrated in the image on the right. So, see that the correct layer is being selected in the Layers Palette before adding a new layer. 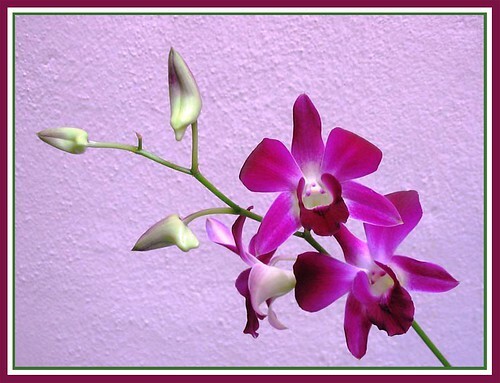 Posted below are the final results of drawing photo borders with added layers – first picture of flowers of Java Rose Apple was framed with two alternating colors, whereas the next image of Dendrobium orchid has 3 borders of varying colors. Sometimes, just applying a combination of simple photo border techniques to an image can produce fabulous results. 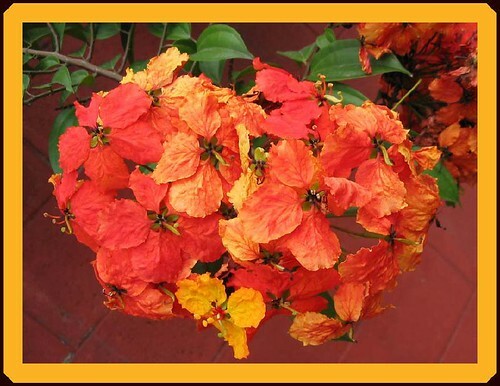 That was what I did with the image below, of a flowering cluster of Bauhinia Kockiana. Here, you just need to recap what you’ve learnt above. 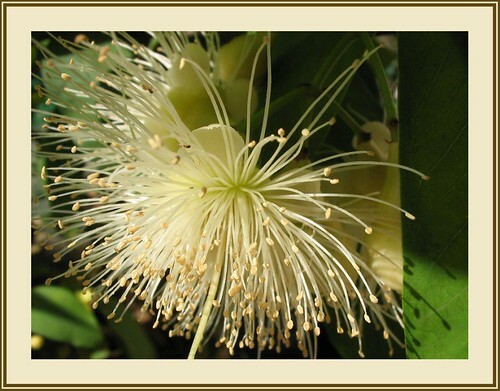 First create a photo frame by adding a new colored layer and then apply a Stroke effect. Step 1. Create a single new layer, then increase its canvas size and color it by following Steps 1 to 3 above. In this example, canvas size was increased by 80 pixels for Width and Height. And, a very dark brown color (#220404) was selected from the image with the Eyedropper Tool to fill the new layer. This in itself has presented a photo frame for the image. However, you can be creative and enhance it by applying a simple Stroke effect. Step 2. Apply a simple Stroke that will spread over some parts of the newly colored border. To do this, first select the Photo Layer in the Layers Palette, then go to Edit > Stroke and make your selections when the dialog box pops up. 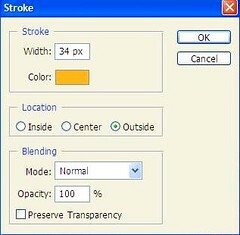 Do play around with the options in the Stroke dialog box and you’d be amazed at what Photoshop has to offer! Just Ctrl+Z to undo previous action, each time you want to try out a new one. Step 1. Open the image that you want to work on – press Ctrl+O (or go to File > Open). Press Ctrl+- to zoom out the image so that you have some working space (grey areas around) to enlarge your canvas area. Next, set the background color for your canvas area which will become the border, it can be black, white or whatever. (Tip: look at the 2 color boxes at the bottom of the toolbar, you’ll notice that pressing D will reset the default foreground color to black and background color to white, and pressing X will toggle between the 2 colors). If you want other colors, just click on the Set background color box and the Color Picker palette opens up for your selection. 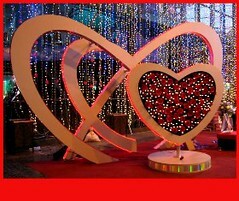 In this example, I’ve chosen red (color #f40b0b) to complement the image depicting Valentine’s Day. Step 2. Next, select the Crop Tool from the toolbar (or tap C) and drag a cropping marquee border on your image. It need not be precise. Now, drag the side or corner handles of the marquee border outside the image area and into the grey area to increase the canvas size. Adjust and properly position the border as you envisioned. If you need to nudge minutely any side, hold down the Ctrl key as you drag that side. 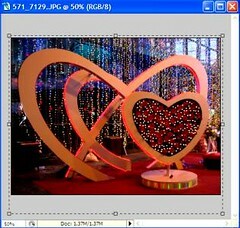 When done, press Enter or double-click inside the cropping marquee. Immediately, you’ll notice the grey areas outside your image change to the background color you’ve set at Step 1 above, to become the border you had wanted. If for any reason, you’re unsatisfied with the result, press Ctrl+Z to undo and start again. In this example, I’ve given a thin border on 3 sides with a larger text space at the bottom as shown on the left image below. The right image shows the newly added border. Here on, you can add text (refer to Step 9 of my Greeting Card tutorial), titles or copyrights. You can even draw another border to your image, using the Stroke command. 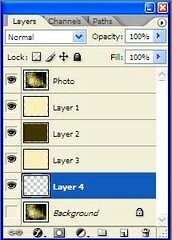 To do this, you have first to unlock the Background layer at the Layers Palette by double-clicking the layer, then click OK when the New Layer dialog box pops up. Next, go to Edit > Stroke and make your choices when its dialog box appears. In this example, to complete the project, I’ve applied a thin 4px stroke in black to frame in the final image and typed in a Valentine’s Day greeting, as well as drawn 2 tiny custom-shaped hearts (use the Custom shape tool from the toolbar). Adding borders not only easily make images look more attractive and glamorous, but also gives easy placement of greetings, titles and copyrights! Hope this tutorial had been helpful! I used this tutorial today and it helped me greatly. It is very clear and I followed it easily. Thanks for posting it! I will like know about the way can learn it, because wanna make my own border and frame, i been waiting get this kind of information as a tutorial. You’re most welcome, rashmi! Great to know that you find it helpful.